We are working with a pool of professionals who are diligent at their work and make sure that the offered lot is packed in high quality material and timely dispatched. Rooted in Nagpur(India), the company is providing qualitative products and that too at the most reasonable prices. 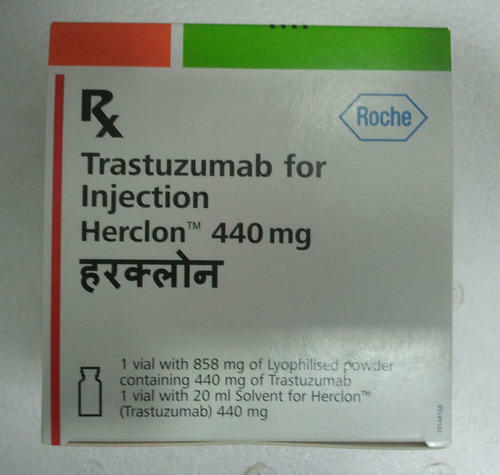 Herceptin 440 Mg also popularly known as Herclon in India is a cancer medication (monoclonal antibody), which acts by interfering with the growth of cancer cells as it slows its growth and hence restricts it to spread in the body. This medication is indicated for the treatment of metastatic breast cancer that has progressed after treatment with other chemotherapy. It may be used along with other medicines. Herceptin is also used to treat metastatic stomach cancer in combination with other chemotherapeutic agents. To buy Herclon 440 mg in bulk quantities & cheap prices, please contact us. We are currently dealing in many countries including Europe, Middle East, Africa & South America. We also sell to patients directly.